Belfast boxers Tommy ‘The Tiger’ Tolan and Philip Townley are set to go toe to toe with each other, for the vacant Irish International Professional Middleweight title, at the Devenish Complex in Belfast this coming Saturday, March 14th. Belfast, NI – Thursday 12th March 2015 - The transformation of Tolan’s career over the past year has been astonishing, following a string of losses going back to 2011 his career began to turn around late in 2014, when he beat Matt Scriven in Leeds. In February this year Tolan returned to Leeds to secure another excellent win, this time over Slovakia’s Rastislav Frano, who at that time was coming of two big wins himself. Speaking from his home earlier Tolan said. “I’m really looking forward to Saturday, It’s going to be a great night. Supporting the all Belfast headline bout sees another local lad Eamonn Magee Jnr, the son of the former Commonwealth and World Boxing Union World Champion of the same name, making his second pro outing against Slovakia’s Dinars Skripkins. Magee comes into the fight high in confidence, following his sensational second round stoppage win over Zoltan Horvath on his debut back in June. In taking that victory, Magee Jnr proved to be a proper ‘chip of the old block’, the youngster boxed beautifully throughout, but more importantly finished off his more experienced opponent with a world class left hook, in much of a similar manner as his famous father had done on so many occasions during his illustrious career. Former amateur star Matthew Fitzsimmons, will be making his pro debut on the show, against Slovakian Aleksandrs Birkenbergs. Fitzsimmons had a stellar amateur career, winning forty seven of his fifty one outings, and the smart money is on the youngster being yet another star of the future to emerge from the famous All Saints club. In addition to the bouts above, there will further bouts featuring local fighters. 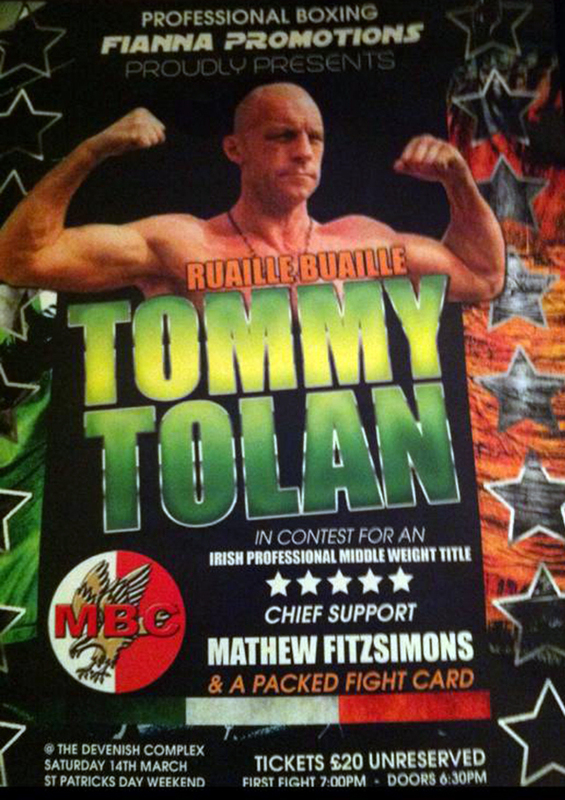 Tommy Tolan versus Philip Townley, for the vacant Irish International Professional Middleweight Championship, headlines the Fianna promotions event at the Devenish Complex in Belfast on Saturday 14th March 2015. Tickets, priced £20 are available from the boxers taking part or call Tommy on 07907 030852 or Peter on 07516 260955. Doors open 6:30pm, first bell 7pm.